Sundance 2009 opened this evening with a claymation film for adults called Mary & Max, from the guy who made that Oscar-winning short Harvie Krumpet. Sorry to make another pointer post, but for the next week I'll be blogging about Sundance over at Paste. On one of our podcasts from last year we talked about how odd Hellboy II is, that it seems like the sort of thing made for young people or kids, but it has language and violence that you normally wouldn't put in a children's film. 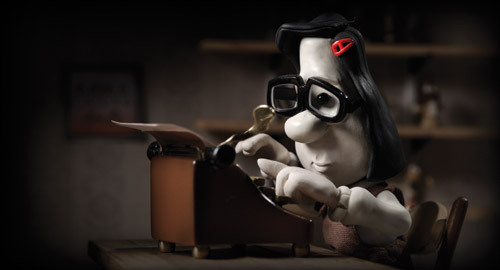 I'm not sure who it's for, exactly, and I feel the same about Mary & Max. Cute, sentimental claymation that touches on suicide, Asperger's syndrome, sexuality, depression, pharmaceuticals, drunkenness, etc. An odd mix. More at the Paste blog. For more immediate and ill-considered reactions to films, watch the Daily Plastic sidebar or join us at Twitter.